SBC version 3.98 addressed the remaining known stability issues running under Excel 2011 on the Mac. Unlike other versions of Excel, the Open and Save dialogs do not retain the directory that was selected during a previous Open or Save dialog. It always will revert to the directory where the SBC was launched. There is no obvious fix for this. This can be caused by previous use of the Excel Developer tab and the VBA editor. Sometimes, clicking on the Developer tab and opening and closing the VBA editor will fix this. Also helps to insure that the "Home" tab has been clicked. Occasional crash may occur when a Team Worksheet is opened for the first time. This can occur when it had been used with a different version of Excel, especially crossing from Windows to Mac versions. Relaunching the Team Worksheet will usually fix this. This was the result of debugging code that was not removed in the 3.99 release. Simply hit the Continue button to resume operation. This has been fixed in version 3.991. The SBC attempts to configure the file selection dialog box to show just the relative file types (file type filtering) for each import operation. On some versions of Excel, this function does not always work correctly. If you are not able to select a desired file, terminate the dialog box and disable the Source File Filtering option in the Edit / General Preferences command. Then, rerun the import command. Version 3.98 fixed the problem where the screen zoom slider (lower right hand corner of window) was inactive/dimmed after completion of SBC initialization on some Windows version of Excel. This will adjust the sizes of the menu text, tooltips text, and tooltip icons. This will apply to Excel as well as other windows and applications. Starting with v3.80, the SBC release has been verified on the Excel Office 2016 General Release on the Windows platform. It should be noted that Excel 2016 on Windows does not co-exist with previous versions on the same machine. Attempts to run the SBC will likely fail. Best to run Excel 2016 on a different machine with no other versions of Office. The Excel Office 2016 Release for Mac OS X is not supported as some critical functionality for SBC operation has been dropped. Starting with v3.80, theSBC implements a new Schedule and Results Manager capability. The user can optionally generate a web page and link to the schedule if desired during One Step Web Site processing. If enabled, this may cause conflicts with user-generated links to schedules (ie: using the User Notes area or an optional link to an external schedule) as the Schedule link label and filename are automatically generated. The One Step Web Site command and associated Preferences commands will warn the user if a conflict exists and to take corrective action. With the advent Excel 2007, the user needs to be aware of the following compatibility and configuration issues for proper operation of the SBC. Note that in Excel 2007, the File tab is not present - Clicking on the Excel globe performs this function. In Excel 2010 and beyond, the File tab was restored. Excel must be configured to allow the SBC to execute from the directory where the SBC files are intended to be stored. This is performed in the Trust Center under the File/Options/Trust Center/Trusted Locations tab. The default setting is Disable all macros with notification. This is the safest setting. 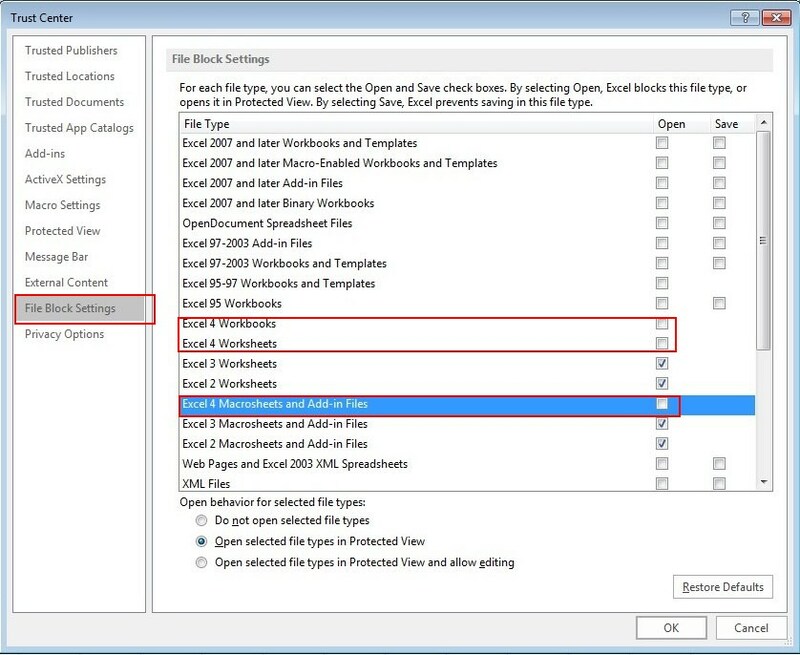 The version 4 workbook, worksheet and macro sheets should be unblocked as shown in the File Block Settings dialog. After the Trust Center configuration has been completed, launch the SBC by clicking on the SBC_Macros.xlm file. After Excel loads, you may see an alert warning about the file format, answer Yes. You will then see a security prompt to allow macro execution. Depending on the version of Excel, the alert will show in the message bar at the bottom of the window or just under the Ribbon area. Click on the Enable Content button to continue. A standard file open dialog will appear. Select a Team Worskheet file to open. The SBC should launch normally at this point. The file will be verified that it is a Team Worksheet. After you see the SBC READY message in the message bar, quit the SBC via the File/Quit Softball Team Calculator menu command. No need to save the file at this point. This sequence only needs to be performed once. Subsequent launches of the SBC can then be performed by clicking on a Team Worksheet. With the Excel Ribbon Interface, the SBC menus and toolbar now appear under the Add-Ins tab. 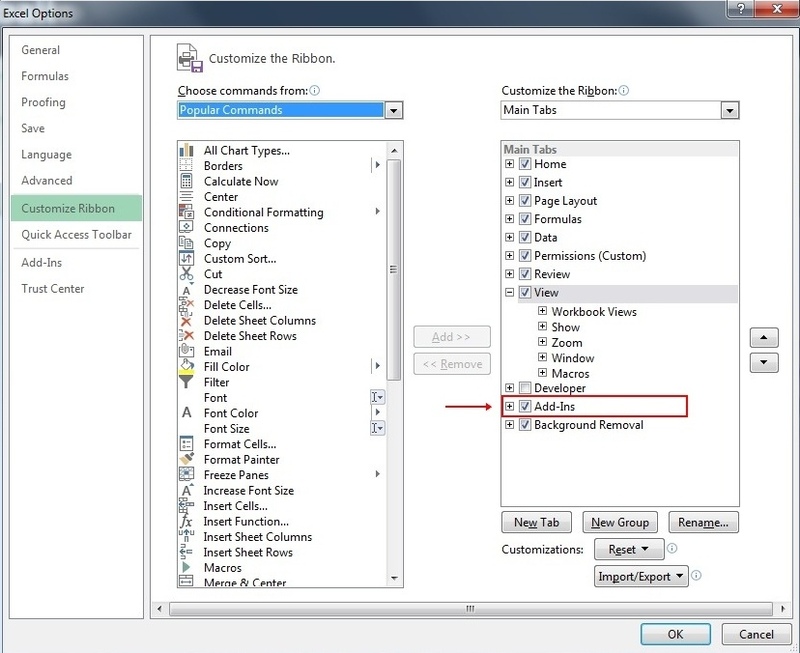 If the Add-Ins tab is not visible, make sure it is enabled via the File/Options/Customize Ribbon dialog. When saving an SBC team worksheet, make sure to save it in the orginal .xls format. If you save it in the new .xlsx format, you will not be able to re-launch the SBC. Version 3.70 has a bug that causes incorrect lines scores to be retrieved on box score web pages and when printing. Manual retrieval of a selected game line and box score was not affected. A fix has been incorporated into Version 3.71. There appear to be a number of web sites that show up in searches that claim to have key generators or uninstallers for the SBC. Do not utilize these sites !!! They are rogue sites that likely contain viruses that will infect your system if installed. The SBC does not require a password or key to install, use or uninstall the program. To uninstall the SBC, simply drag the SBC_Macros.xlm file to the trash. Starting with version 3.60, web sites generated via the One Step Web Site Command generate Responsive Design web pages. This means that there are no longer separate web pages for desktop and mobile browsers. If you have team web sites that were generated with Version 3.50 or earlier, it it suggested that they be regenerated using version 3.60. Check any user-defined links to insure that they will point to the correct web pages. This problem appears primarily on non-English versions of Excel. It is a result of major differences and lack of some critical functionality in the underlying macro engine in the internationalized versions of Excel. The SBC does not have language support for non-English languages. The solution is to try to obtain an English language version of Excel (Mac or Windows), preferably a US version. Review the SBC User Manual Section 1 for more details. With the advent of Excel 2008, Excel has implemented a new Ribbon User Interface. This is a hybrid approach with the SBC menu bar still appearing at the top and a ribbon similar to that found on Windows versions of Excel. The SBC floating toolbar is still available. The support of Page Break Preview mode has been dropped in these versions. The SBC will automatically switch to Normal View when launched under Excel 2011. This needs to be performed manually under Excel 2008. This version of Excel dropped support of some ciritical macro functionality needed to support user defined web graphics objects placed in the content area of a Team Worksheet. Any web graphics that were present in previous Team Worksheets will still be visible on the screen and on printed pages. However, they will not appear on web pages. The web graphics are still retained in the Team Worksheet for SBC compatibility with other versions of Excel. Support for masthead logo graphics is still supported. Microsoft's 11.6.1 security update released 10/12/2010 has caused a major issue with previously created Excel worksheets. The SBC team worksheets will experience this problem and will fail to open or launch the SBC macros. On 10/15/2010, Microsoft released the Microsoft Office 2004 for Mac 11.6.2 Update that fixes the problem. The SBC works properly with this revision and beyond. Every effort has been made to validate the functionality of the SBC under a variety of versions of Excel®, multiple releases of Microsoft Windows® and Macintosh® operating systems and a variety of popular web browsers. If you encounter a situation where the SBC does not deliver the expected results, check the Revision History and Errata document. Next, check the section on Troubleshooting in the SBC User Manual. If you still have difficulty, send a support request email. Insure that your email client and spam filters allow this address. Is the issue repeable ? * Can be obtained from the File / About Softball Calcolator command.